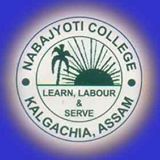 Nabajyoti College, Assam was established in 1971 in a small town of western Barpeta called Kalgachia. It was aimed that rural poor people from Kalgachia, Kharichala, Gunialguri,Balavita, Kookia, Aditpur,Chakla can easily attain higher education rather than going to long distance i.e Barpeta.The word 'NABA-JYOTI' stands for 'NABA' - New and 'JYOTI' - Light or Knowledge. Nabajyoti College, Kalgachia offers various graduate courses as well as Post Graduate courses. Nabajyoti College, Kalgachia is affiliated to Gauhati University, Guwahati. List of facilities available at Nabajyoti College, Kalgachia for students. This page was last modified on 5 July 2014 at 12:07.